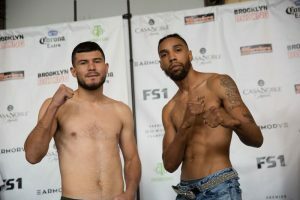 The two best boxers in Minnesota delivered distinct messages by scoring early-round knockouts at the Armory last Friday night in Minneapolis. Jamal James (24-1, 11 KOs) told the welterweight division “Here I come!” with his second-round knockout of Mahonry Montes’ (35-8-1, 24 KOs). While Caleb Truax announced “I am still here!” to the Super Middleweight division with a dominating performance against Fabiano Pena (15-11-1, 10 KOs). Jamal James believes that he belongs among the elite fighters at 147 lbs. Known as a slick boxer who uses his length to frustrate opponents, James surprised many with the power he displayed in the fight. In the first round, the fighters threw inconsequential punches to size each other up and find their rhythm. Montes launched his attack in the second round and was building momentum until James landed a series of right hands. The first shot landed squarely on Montes’ chin, rattling the veteran fighter from Sinaloa. James capitalized on the moment by continuing to throw his right hand over Montes defense. When Montes finally lifted his gloves to protect his head, James finished him with a vicious left to the body that ended the fight. “I was able to hurt him early with a right hand and then that body shot just sunk him.” said an exuberant James. The welterweight division is full of marquee names and big money fights. After successfully headlining two nationally televised cards in his hometown, Jamal James believes that he has earned a shot at a title, most likely a WBA belt, which ranked him as the #3 contender entering the fight. “Hopefully this brings me closer to a world title opportunity, if not a world title opportunity in my next fight.” James responded when asked what this victory means for his immediate future. Even though FS1 turned off their cameras after the James/Montes bout, no one left the arena. Caleb Truax had not fought in his hometown since his shocking upset of James DeGale (24-2-1, 14 KOs) last December. He turned his homecoming match into a sing along by selecting “Purple Rain” to accompany his ring walk and entered the building like a choir conductor. In April, Truax was sluggish in losing his title to DeGale in their rematch, launching rumors of retirement for the 34 year-old. Though he fought as a Light Heavyweight after weighing-in above the Super Middleweight limit and faced an overmatched Fabiano Pena, Truax looked sharp in the fight. After absorbing a few solid punches from Pena, he took control and pummeled his opponent with a barrage of power shots, ending the fight in the third round with a sensational upper-cut. The victory put Truax in the mix again at Super Middleweight with the potential to face powerhouses like Jose Uzcategui and David Benavidez, a third fight with DeGale or possibly Julio Cesar Chavez Jr this fall. For the second time in 45 years, professional boxing returns to the Armory in downtown Minneapolis. Last April, hometown contender Jamal “Shango” James (23-1, 10 KOs) outlasted Abel Ramos (20-3-2, 15 KOs) in a compelling fight that inched him closer to a title shot and introduced the Armory as the Midwest’s most intriguing boxing venue. This Friday night, James will headline a marathon PBC card by facing Mahonry Montes (35-7-1, 24 KOs) in a 10-round welterweight bout (FS1 and FOX Deportes starting at 8:00 ET). Already ranked as the #3 welterweight by the WBA, a compelling win against Montes will put James in contention for a fight with WBA Super Champion Keith Thurman (27-0, 22 KOs) or WBA World Champion Manny Pacquiao (59-7-2, 38 KOs) in 2019. Jamal James is taller, faster and has a considerably longer reach than Montes. This isn’t news to the veteran fighting out of Sinaloa, Mexico. In James’ last fight, Abel Ramos came to Minneapolis with the same strategy. A shorter and slower fighter than James, Ramos struggled in the early rounds, but as the fight progressed he figured out how to land his own shots and avoid James’ best weapon, the straight right hand. Ramos lost a very close split decision, but he may have laid the blueprint for how other pressure fighters might counter James’ speed and height. “This is a step to get to that world title.” James told reporters after he weighed-in at two pounds below the 147 lbs limit. A win would be a significant step in his career and one he will attempt in front of his hometown fans and a national audience. But the staircase that boxers must climb in the welterweight division is steep. A misstep by “Shango” on Friday would send him tumbling down the rankings in boxing’s deepest division and out of the welterweight title conversation. Fellow Minnesotan, Caleb Truax’s (29-4-2, 18 KOs) fight won’t be televised, but he will be on Friday’s card as he looks to make one last title run at super middleweight. He faces the relatively unknown Brazilian boxer, Fabiano Pena (15-10-1, 11 KOs) in a match that is meant to show Truax still has gas in the tank and is ready for what would be his third fight with James DeGale (24-2-1, 14 KOs). 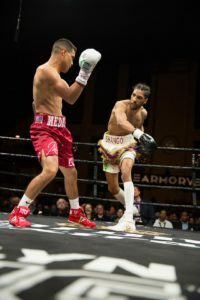 Jamal “Shango” James outlasted a sturdy and persistent Abel Ramos last Friday night in front of a loud, partisan crowd at the Armory in snowy Minneapolis. He won by the slimmest of margins, splitting the judges 95-95, 96-94, 96-94. Clearly enthused to be fighting at home, James came storming out of the gate throwing flurries of punches behind sharp double and triple jabs. He appeared intent on scoring another early knockdown, building on the third-round KO he registered in December against Diego Chaves. Abel Ramos looked very comfortable at 147 lbs. and weathered the first-round storm. He steadied himself in his corner and launched his own offensive in the 2nd round, catching James with a left hook that nearly flattened the hometown fighter. James’ strategy to use his length and quickness to outbox the shorter, slower Ramos proved to be a winning formula, but the victory wasn’t as easy or as decisive as Shango had hoped. In the first half of the fight, Ramos absorbed combination after combination from James, but he never flinched. In fact, Ramos kept pursuing the quicker fighter and by the middle of the fight he was starting to land with more success. Solidifying his reputation as a difficult target, James ducked, dodged and leaned away from Ramos’ power shots. “I got slick on the inside because I knew he was going to keep pressuring me.” James said about his mid-fight strategy. James was also aided by the 3,500 fans who braved the weather to back one of the best prospects Minneapolis has produced in the last two decades. Chants of “Shango! Shango! Shango!” started in the third round and were repeated throughout the fight. James appeared to draw energy from the supporting crowd in the late rounds when he was cut over his ear and losing steam. The Armory felt like it was made for the sweet science and is poised to host future fights. It was a reminder that live boxing is best when the crowd has skin in the game and is emotionally invested in the main event. The vocal fans may have nudged a round or two on the judges’ scorecards towards James, as a number of rounds could have gone either way. The WBA was already on board with Jamal James as a top contender at welterweight and it will be interesting to see if this fight will improve his standing with the other sanctioning bodies. In the locker room after the victory, Shango was both elated and palpably relieved. He came through in the biggest fight of his life and defeated a tough opponent in front of his friends, family and a national audience. The Turning Stone Resort Casino in Verona New York was the host site for the night’s PBC on ESPN broadcast. King’s Promotion was the lead promoter for tonight’s card. The co-main event of the night was between late replacement Jamal James (20-0) and former Cuban amateur standout Yordenis Ugas (15-3) in the welterweight division. Jamal James took the fight on short notice and replaced undefeated Bryant Perella who had to withdraw due to an injury to his hand. Ugas, a former Olympic bronze medalist, was surprisingly caught with a lot of jabs and quick combinations to the head in the opening round. However, Ugas stayed consistent with his attacks to the body and looked to work the trunk of his lanky opponent. for punch in the fourth round, but Ugas’ punches were getting through James guard at a higher clip. The pace favored Ugas in the middle rounds, and he stayed patient and was crisp with his counter rights and even knocked out the mouthpiece of James in the sixth round. James’ looked like he was tiring in the eighth and ninth rounds and did not have the ability to seriously hurt Ugas, who looked like he was content on winning a decision victory. Ugas returned from a two year layoff to win the decision victory with scores of 99-91, 98-92, and 96-94. The main event of the evening was a super featherweight belt between Miguel Flores (20-0) and Ryan Kielczweski (25-1). Neither boxer was known for their power and both fought out of an orthodox stance. Kielczweski looked to be bigger and thicker than Flores, but he could not match the speed of Flores. 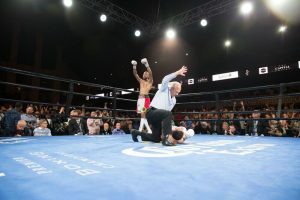 Flores focused his attacks to the body of Kielczweski in the opening two rounds, and besides a right hand from Kielczweski in the opening round on a backward moving Flores, Flores dominated Kielczweski with a high volume of shots to the body. Kielczweski was able to momentarily trap Flores by the ropes in the opening minute of the third round and land some good shots to the body, but Flores ‘ work rate was just too much for Kielczweski to keep up with. Flores remained in control in the fourth and fifth rounds and the cumulative effects of his punches were starting to wear down Kielczweski. He remained in the pocket several times and freely threw quick combinations at Kielczweski, but Kielczweski did have his moments in the fifth round. Kielczweski pressed the pace in the sixth round but Flores was able to deftly stick and move and avoid taking any serious damage. Kielczweski took several more hard combinations in the seventh round but showed he had the chin to take the best shots of Flores. Kielczweski fought valiantly in the final three rounds, and was able to land some of his power shots, but Flores landed two punches to every one that Kielczweski landed. Miguel Flores remained undefeated with a decision victory with scores of 97-93, 96-94, and 96-94.